Decorative trims and tassels are a popular addition to many of today’s window treatments and accessories. 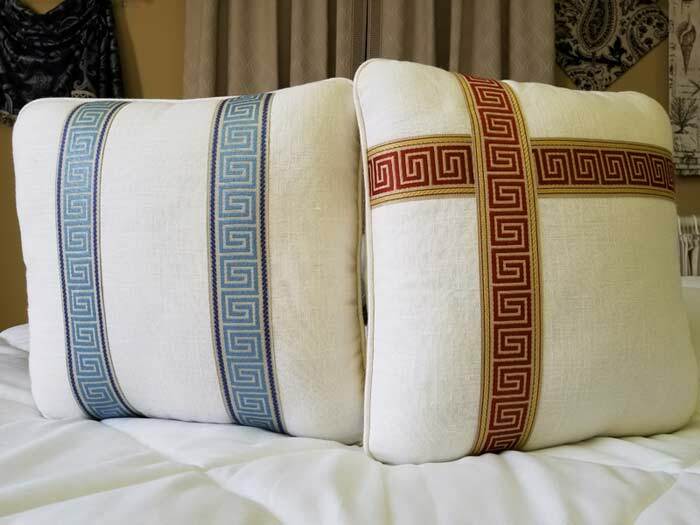 We offer several different types of trims, fringes and tassels that can be incorporated onto many of the pillows, table decor and window treatments we fabricate. We have all been there. Found the perfect comforter or duvet cover only to find out that you can’t get the size dust ruffle you need or that the set you like doesn’t have any curtains to match. Very frustrating to say the least. You would think that with all the different comforters and bedspreads available you could readily find what you need. Not so, especially if your mattress is not a standard size. And let’s face it today’s mattresses range from low profile mattresses of no more than about a 10 inch drop to higher profile mattresses up to 22 inch drops or more.There just in no such thing as a standard mattress anymore. Custom bedding allows you to purchase dust ruffles and custom comforters in the drop height needed for your particular mattress as well as offering you the flexibility to mix and match fabrics of your choice for the coordinating dust ruffles, drapes, throw pillows and shams. Need a California King dust ruffle with a 20” drop – no problem! You can have your pillows and pillow shams made using one fabric for the pillow body and another contrasting fabric on the ruffles. If you want your bedroom to look as if you hired a professional decorator – choose custom bedding! You be your own designer and get the sizes you need for a custom look without the “professional decorator” price. Treat yourself to some custom bedding this season. Custom bedding can brighten up your bedroom and show of your style. Decorating a bedroom just the way you want it is always a fun project. There are many nice bedroom sets to chose from at retail stores, however we offer 350 different fabrics that will be custom sewn into a bedding set just right for you. Have the drapery curtains and throw pillows made to co-ordinate with the bedding and the room will be complete.